Fort Sutch is a small fort north of Anvil containing mercenaries (quest-related). It contains only one zone, Fort Sutch. 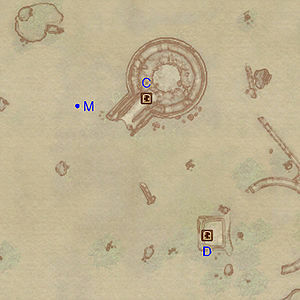 Attack on Fort Sutch: Help a group of soldiers close an Oblivion Gate (non-journal). 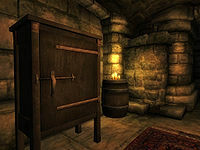 If you go here before the Dark Brotherhood quest it is full of mercenaries, similar to Marauders. No one is on Roderick's bed (you can sleep on it if you like) and there is no medicine cabinet. 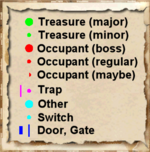 There was originally a city named Sutch at this location; the city was, obviously, removed before release, but the fort and the Oblivion gate remained. In addition, there are two references to the "city" of Sutch in journal entries for the Fighters Guild quests Mystery at Harlun's Watch and The Wandering Scholar. A city named Sutch located in Hammerfell is mentioned in the book Thief of Virtue. 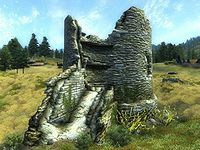 There could be a connection, considering Fort Sutch's location near the border of Hammerfell. Entering the area FortSutchExterior02 will trigger a dungeon soundtrack rather than the wilderness track that would be expected. This location's map marker (M on map) is named Fort Sutch (editor name FortSutchMapMarker). The entrance door is SE of the marker, 190 feet away. Fort Sutch covers a large area. In addition to FortSutchAbbeyExterior, FortSutchCastleExterior, FortSutchExterior and FortSutchExterior02 cover the castle grounds. Esta página foi modificada pela última vez à(s) 20h44min de 11 de março de 2014.